With careful speculation and sometimes a few bold moves,you may earn the essential items by giving away the less critical ones. Can you outsmart your opponent and win the most favors of the geisha? 1 Charm Points (equal to the number of Item Cards of the corresponding type). 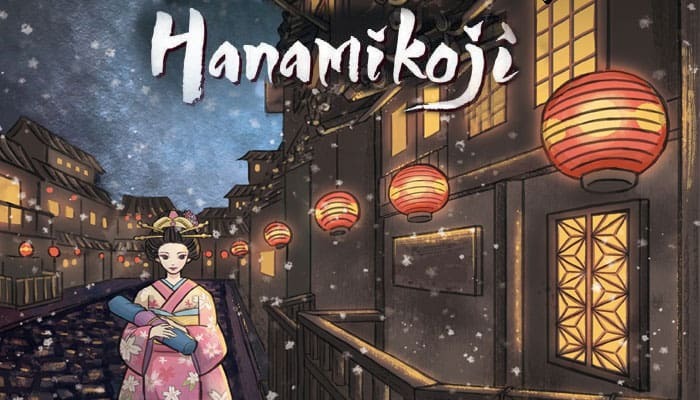 In the game of Hanamikoji, the aim is to win 4 Geisha or 11 (or more) Charm Points. You and your opponent take turns to perform actions to get different kinds of Item Cards. For each Geisha, if you have more Item Cards of the corresponding type than your opponent, then you win the Geisha's favor. The game will continue until either player has reached the winning goal in the Scoring phase. 1 Place 7 Geisha Cards in a row, in the following order from left to right, between players. 2 Place 1 Victory Marker on the center of each Geisha Card. 3 Stack the Item Cards face-down into a pile and place them aside. 4 Each player takes 4 Action Markers of the same color with the colored side up, and places them in front of himself. The younger player is the starting player. If any player reaches the winning goal in the Scoring phase, the game ends immediately. If neither player reaches the winning goal, the game proceeds to the next round. The game will continue until either player wins. The starting player shuffles all 21 Item Cards into a face-down pile, and randomly removes 1 card from the game and put it back to the game box unseen. This card will not be used this round. Nether player is unable to check it. Deal each player 6 Item Cards as a hand. Hand information is hidden. Stack the remaining Item Cards face-down as the "Item deck" and put them next to the row of Geisha Cards. Beginning with the starting player, players alternate to take one turn (Player A -► Player B -► Player A -► Player B -► and so forth) until both players have taken 4 turns. In your turn, you must draw a card from the Item deck, and then perform an action. There is no fixed action order. When you perform an action, you choose 1 of your face-up colored side Action Marker and perform the corresponding action. After resolving the action, flip the marker face-down. You can't choose face-down markersd (each of the player's action markers will only be used once during the round). Choose 1 card from your hand, and place it face-down under the Secret marker. This card will be revealed in the Scoring phase and be scored. You can check this card at any time. Choose 2 cards from your hand, and place them face-down under the Trade- -off marker. These cards will not be scored in this round. You can check these cards at any time. Choose 3 cards from your hand, and place them face-up in front of yourself. Your opponent chooses 1 card from them, and places this card on his side next to the corresponding Geisha. 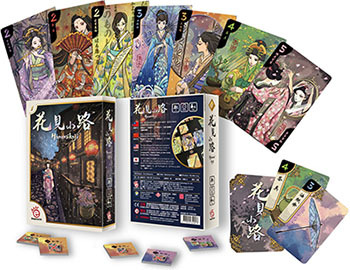 Then, place the 2 remaining cards on your side next to the corresponding Geishas. These cards will be scored. Choose 4 cards from your hand, and place them face-up in front of yourself. You divide them into two sets, each containing 2 cards. Your opponent chooses 1 set, and places these 2 cards on his side next to the corresponding Geishas. Then, place the 2 remaining cards on your side next to the corresponding Geishas.T hese cards will be scored. After both players have performed 4 actions, the game proceeds to Phase 3. 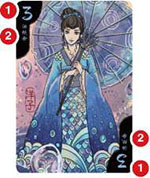 One side is more than the other: The side with more Item Cards wins this Geisha. Move the corresponding Victory Marker to the winning side. Two sides are draw or no cards: Don't move the Victory Marker. After scoring, both players calculate the number of Geisha they win and the sum of their Charm Points. If any player reaches the winning goal, the game ends immediately (See: End of the Game). Pick up ALL the Item Cards on the table and in the box, stack them face-down into a pile and place them aside. Victory Markers remain in place. Note: Don't move them back to the center of each Geisha Card. Both players flip their Action Markers face-up. The second player becomes the new starting player. The next round is ready to begin. If any player wins 4 Geisha or 11 (or more) Charm Points, the game ends immediately. If only one player reaches the winning goal, he is the winner. If one player wins 4 Geisha and the other wins 11 (or more) Charm Points, the latter is the winner. Example: Top player wins 3 Geisha, with a total of 8 Charm Points. Bottom player wins 3 Geisha, with a total of 11 Charm Points. Since the bottom player reaches the winning goal, the game ends immediately. Bottom player is the winner.